Often regarded as one of the most beautiful regions on Earth, Scandinavia is made up of multiple countries and has a fascinating history, as well as countless pristine natural environments and beautiful landscapes to admire and enjoy. Traditionally, the region covers the three countries of Norway, Sweden, and Denmark, but the term can also be used to cover Finland and Iceland too. With the Baltic Sea to the south and the Norwegian Sea on the northern side, Scandinavia is completely surrounded by water and cruises are a wonderful way to explore this region, offering incredible views of its beautiful vistas and stopping off at plenty of key cities and locations along the way like Copenhagen, Stockholm, Oslo, and more. All kinds of Scandinavian cruises are available, ranging from simple trips that last just a few hours to multi-day tours of multiple nations and locations. Many people tend to assume that Scandinavian cruises cost a lot of money, and some of the longer tours do cost several thousand dollars, but much cheaper cruises can be found around Scandinavia too. If you're looking to enjoy some of the very best Scandinavian cruises around countries like Norway, Denmark, Iceland and more, consider booking one of the great options below. One of the biggest natural attractions and true wonders of the world is the Northern Lights. Many people visit Scandinavia purely with the hope of seeing these colorful, beautiful rays of light illuminating the night sky. This Viking Ocean Cruises tour lasts for 13 days and explores the northern, Arctic section of Norway, taking in stops like Alta and Narvik. Snowy scenes and husky rides are part of this tour and every guest should get multiple chances to see the Northern Lights and take plenty of photos of them. This week-long Scandinavian cruise takes in all of the big cities and locations around Scandinavia and beyond. To get a full and authentic Scandinavia experience, this is a great option to choose, taking in cities like Stockholm, Copenhagen, and even St. Petersburg. 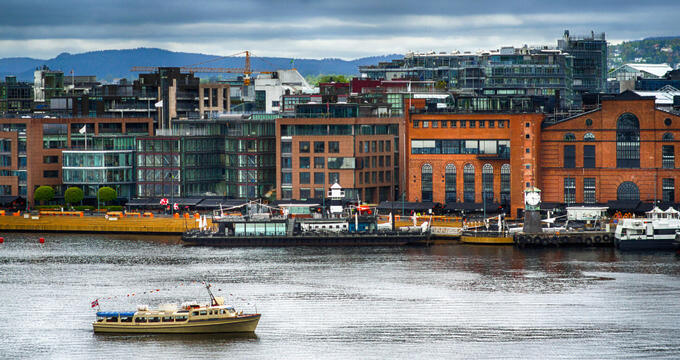 For a short and simple Scandinavian cruise experience that anyone can afford, hop aboard this three hour tour of the Oslo Fjord. Take in the beautiful sights of the city itself from the deck of an impressive wooden vessel. Snap photos of landmark sights like the Oslo Opera House as you float along and watch the sun setting on the horizon. This is a seven day Scandinavian cruise that starts off in Berlin, Germany before setting off to take in the beautiful city of Tallinn, Estonia, the cultural heart of Russia, St. Petersburg, and then on to the classic Scandinavian city locations like Copenhagen and Stockholm. You'll see dozens of beautiful landmarks, monuments, and natural landscapes along the way and have plenty of chances to explore this gorgeous part of the world. This 12-night Scandinavian cruise will see you sailing in the lap of luxury on one of the finest cruise vessels on the planet. The tour takes in the Baltic region, as well as Scandinavia, stopping off at Helsinki, Stockholm, St. Petersburg, Copenhagen, and even Amsterdam along the way. It only runs a couple of times per year, making this one of the most exciting and exclusive Scandinavian cruises in the world. If you just want to see the major capital cities of Scandinavia with all the comfort and luxury of a cruise that doesn't cost too much money, this four day option from Authentic Scandinavia is a super choice. You'll stop off at Oslo and Copenhagen, but the tour can be extended to check out the likes of Stockholm, Helsinski, Tallin, and more. For a full Scandinavia and Baltic cruise package, this 19-day tour from Holland America is simply unbeatable. You'll spend nearly three weeks being ferried around from one stunning location to the next, seeing all of the most incredible sights and scenes of countries from Estonia to Sweden and more. As the name of this Scandinavian cruise implies, you'll also learn a lot about the history of the region, especially regarding the Vikings. Iceland is a beautiful little country with a huge focus on preservation and conservation of its natural environments and locations. With waterfalls, glaciers, stunning vistas, and quaint villages all around, it's an amazing place to visit and this 14-hour cruise takes you all along the south coast, providing a short but highly memorable experience.